With WWB firmly in the rear-view mirror, new conflicts have been escalating in the North. Former allies in the Moneybadger Coalition, whose purpose it was to topple the Imperium, are at each other’s throats. The infamous Black Wedding, in which Snuffed Out “awoxed” Shadow Cartel supers, was the first departure of note from the anti-Imperium coalition. Since then, a kind of thunderdomesque (yes, that’s a word now) state ensued, where the big players of northern lowsec and nullsec would fight each other one day, only to temp blue to fight a third party the next. Lines in the sand gained definition over time, however. To the outside observer, this might well have looked like diplomatic chaos, bordering on a large scale free-for-all. As things seemed to turn out, Pandemic Legion anchored one side, with the occasional support of NC., Mercenary Coalition, Waffles and Pandemic Horde, while Co2, TEST, Snuffed Out and Project Mayhem formed the other side. However, these are muddled lines as, for instance, Waffles and Snuffed Out / Project.Mayhem work together against other parties on occasion. It should also be noted that while PL and NC. are permanently blue to each other, Co2, TEST, and “Project Box” are not. This isn’t a traditional conflict and there aren’t traditional “sides” to it. From my own perspective, it seems that the only thing that can be said with clarity is that PL are in one corner of the ring. 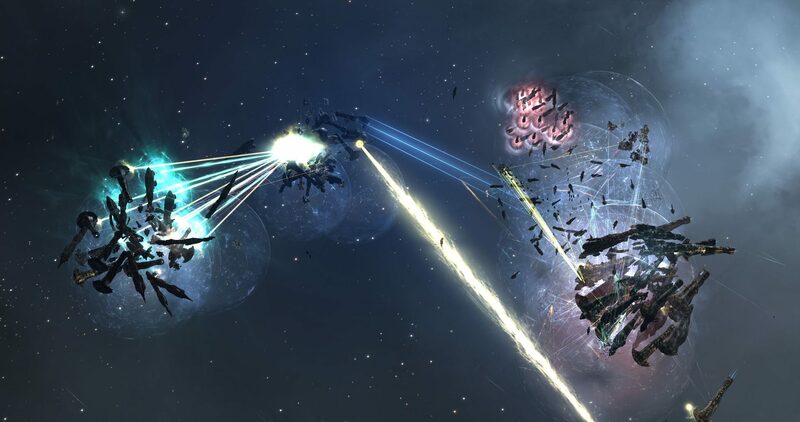 Heavy-handed skirmishes aside, the first real confrontation of note that involved supers and titans happened a few weeks ago, in P3EN-E. 23 titans, 37 supercarriers, and 10 force auxiliaries from PL were caught on the gate, supported by some 140 T3Cs in the subcap department. NC. were nowhere to be seen. The opposing side, consisting of TEST, Co2, Snuffed Out and Project Mayhem did not pull the supercapital trigger (and there’s plenty of tinfoil to go around as to why), and PL supers and titans ended up tearing through the assembled TEST Maelstroms like a hot knife through butter, as you can see in the video below. The second confrontation of note happened this past Saturday, smack in the middle of the Co2-controlled portion of Tribute, in the system of SH1-6P. It started with a Co2 CSAA, and ended up being the biggest battle since B-R. I will not go into a complete overview of the fight; others have already done that, and have done so better than I would have. However, I was there(tm) (Snuff and PM fielded Nightmares), so consider this my perspective, rather than a full, detailed report. In the description of the fight below, we will go over some of the major events in the battle, and some personal observations. Keep in mind that there are large portions of what went down that are shrouded in both opsec and fog of war, and the complete picture is difficult to present, so if you feel that I got something wrong or have something you’d like to add, please do so in the comments section below. PL had reinforced the SCSAA-holding tower and had come back to finish the job with subcaps, supers and titans held in reserve. According to PL FCs on the field, they did not expect Co2 to respond with their super fleet, but that’s exactly what happened. Subcaps initiated the engagement, with separate fleets landing on pings off the citadel at range. The NC. Proteuses and Legions made the first move, engaging a Typhoon fleet which mostly seemed to consist of Drone Walkers. We didn’t really pay them much attention; they were the least interesting variable, so you’ll forgive my ignorance. The combined Snuff / PM Nightmare fleet took the opportunity to start picking off NC. T3C’s, and as subcaps (and later capitals and supercaps) piled in, this became the body of the battle. Co2 knew what they were up against when it came to PL supercaps; not only were they (PL) on field before Co2 committed their own titans and supers, they also gated into the system due to the cyno inhibitor Co2 had put up. At the time of writing it is not clear to me how much intel Co2 had on the NC. supercap fleet, but they must have known it was in the wings. Either way, it is assumed that there was an agreement with TEST to also drop supercaps, from which TEST reportedly pulled out in the last minute. So either Co2 were left to the wolves, or TEST pulled out in the last minute and Co2 still decided to drop. It was also assumed that Snuffed Out and Project.Mayhem had supercaps ready and followed suit after TEST didn’t drop. Naturally, whatever really happened is opsec, so it will have to remain in tinfoil land for now. Shortly after the initial PL titans had landed, they were reinforced by by a gargantuan conga line of Apostles, the likes of which I have never seen, making their supercaps effectively ironclad. Still, Co2 took down the cyno inhibitor they had put down and jumped in their supercapitals, thereby also opening the way for the NC. supercap fleet, which was waiting in the wings. It eventually landed smack in the middle of the subcap and dreadnought mess that was the center of the battle. The layout of the battlefield once the main forces committed was as follows: the center consisted of subcaps from both sides (as well as 3rd parties) and later the NC. supercapital fleet, along with a cluster of Co2 dreadnoughts. Off to the side, some 200+ km away, the PL and Co2 supercapital fleets faced off. Two things should be noted at this time. First, with the small army of Apostles standing vigil over the PL supers, and no more friendly supers in sight, it became clear that the Co2 supers were doomed to fail at best, especially after they had reportedly fired 22 doomsdays at a Nyx that did not die. Second, TEST, while not committing their supers, did bolster their forces on field with a substantial dreadnought force. However, during the fighting, it was reported (and I have not been able to confirm this personally), that a command destroyer pilot had managed to boosh the TEST cyno ship the moment before it lit the cyno. Allegedly, the TEST pilot did not realise he had been jumped 100 km in that moment and lit, putting the TEST “dread bomb” way off its intended insertion point. Unfortunately, I was fiddling around with graphics settings in the just as this happened, which you’ll see in the video below, so I was not able to go back and verify it actually happening. At this point, even though allies and opportunists came piling into the system in all manner of ships (such as LUMPY, who were buzzing about our Nightmares like annoying flies with cheap EWAR frigates), everyone knew where this fight was going. The Co2 supercaps weren’t getting out of this unscathed. Being low on cap, those that were not held in place warped off. The writing was on the wall, and before extracting, we cleared off a number of heavy interdictors in order to ease Co2 doing the same. Still, six titans and a significant number of carriers and dreadnoughts fell victim to the PL/NC. capital superiority, or Co2 hubris, or TEST unwillingness to commit, depending on how you look at it or who you ask. Below is my own recording of the battle, starting as the first fleets hit the field, and ending as the battle was decided and all that was left was people dogpiling to whore on as many capital kills as possible and gore themselves on the subcapitals that remained. (A fun side note, we left for home in ridiculous TiDi, a trip that took well over an hour and taxed fleet morale, cross-jumping Asher Elias Cerberus fleet that was speeding to catch the tail end of the fight along the way, and they still managed to get onto plenty of the kills.) In the video, I have tried to point out at least some of the major events as they happen. My view is limited however, I would recommend that you also try and catch some of the excellent other videos that are out there, especially capital POV ones. Click here to view the battle report. There’s definitely room for a lot of “what-if” theories concerning this fight, but that’s a difficult debate to have when half of the moving pieces are hidden behind inter-alliance diplomacy and opsec calls made on the battlefield. The most obvious “what if” being what if, theoretically, TEST, Snuffed Out, and Project Mayhem also dropped their supers into the fight? This is something that at least PL FCs believed was a possibility. Is that on the cards for the future, or does SH1- shift the trajectory in such a way that this will not happen and the PL/NC. combo retain a kind of proven supercapital superiority? In fact, did they always have it in the post-WWB world, given the diplomatic landscape of the north and the sheer numbers of supers they have? As they say, the proof is in the pudding, and this was just Co2, so it is difficult to tell. That’s just the big, obvious one. There are a myriad of other facets. For example, evidence suggests that the Co2 and TEST capitals, especially the dreadnoughts, were not coordinating and focusing fire. Had they done so, they might have drawn supercapital blood and at the very least changed the complexion of the fight. It should also be noted that while these were the broad strokes, there were a whole slew of smaller fights going on in the subcap department that affected the battle as a whole. There is a tapestry of these smaller storylines weaved into this battle, and hopefully we’ll be able to hear more about them during the coming weeks. So with foolhardy hybris or with balls of steel and a willingness to put their money where their mouth is, Co2 gambled and lost. Whatever the case, you should all prepare for industrial-strength smug from Pandemic Legion from now until the Alliance Tournament, and if that goes well for them, at least through Christmas. Naturally, the SH1 battle had every reporter, blogger and podcaster rushing to their respective medium to either analyse and report, or as in some cases, push their own narrative or agenda. Initially, two interesting aspects have come out of this. First out of the gate was Capri Sun Kraftfoods’ much-debated post, An Open Letter to CCP, in which he basically argued that CCPs whole roadmap strategy is bad for the game – the Phoebe jump changes, Aegis sov and the replacement of POS with citadels. He believes that POS are the main reason that big fights like SH1 happen and that citadel mechanics will kill that gameplay. Don’t take my word for it though; read the article. Capri is not the only one out there that thinks like this, so it’s well worth reading. However, it could be, and has been, argued that Capri is looking at this from a particularly narrow, static, and possibly traditionalist viewpoint. Citadels are a flexible, modern, and dynamic system, able to adjust to evolving demands in a way that POS never could. Conquer mechanics can easily be adjusted and defensive systems balanced, just like ships are. Already, they are generating a lot of content out there. Even this very article would have been published yesterday were it not for a citadel defense op I had to go to, and yes, a good fight was the result, in zero TiDi, mind. Capri is defending the almighty hammer drop, borderline accusing CCP of being hypocritical because he believes they are intentionally killing it by removing POS, while still marketing the game with the battles that escalate over contested towers. One could argue that while CCP might be delivering nerfs to the big hammer, they’re giving us a bunch of medium-sized ones to replace it with, the combined weight of which not only exceed it, but comes with much less soul-crushing TiDi and 3 FPS potato graphics. Seraph IX Basarab delivered a counter to Mr. KraftFoods over at EVE News 24. I would also encourage you to read the many responses to both articles, as well as other reports from the SH1 battle itself, in order to get a somewhat more three-dimensional picture of the battle. Arrendis’ article over at TMC is also a good starting point. Setting the big picture debate aside, the other thing that has cropped up in the discussions after both of the supercapital battles mentioned above, P3EN-E and SH1-65, was that the aiming systems for the new AOE doomsdays Pike and Lance are hard to use, and that this and the fighter interface severely suffer under TiDi. Speaking with PL supercapital commander Doomchinchilla the day after the fight, I was personally treated to his many grievances with the systems. However, it would seem that CCP have some work to do in this department now that there is significant real-world data to work from. Titan pilots are united in agreement that these systems need an overhaul. Because right now aiming them properly seems to consist of a good deal of luck, which is inherently not sound game design. For more on this, I’d recommend a listen to the latest episode of The Asher Hour.